Hearing Dog Marguerite could not have come into Michelle’s life at a better time. 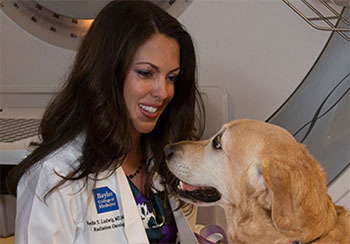 Michelle had just lost her husband to a heart attack two months prior to receiving an invitation to Team Training at Canine Companions to receive a hearing dog. Read more stories of our graduates here. Thanks to you, 366 children, veterans and adults with disabilities received their Canine Companions assistance dogs in 2016 free of charge. Additionally, last year our professional instructors provided in-person support for nearly 950 other Canine Companions teams. Supporters like you made that all possible. Read stories of the teams you’ve helped. 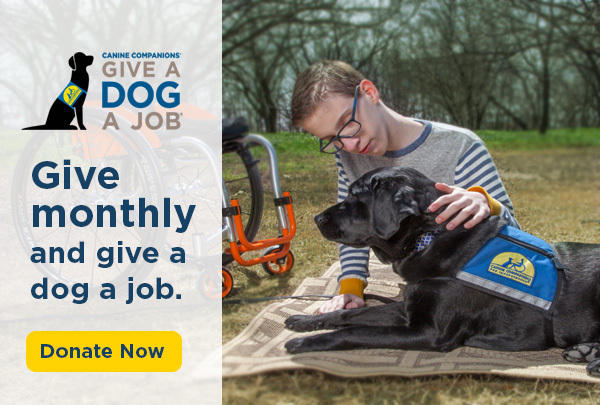 Ever dreamed of working with dogs professionally while improving the lives of people with disabilities? We provide long-term career development with comprehensive, hands-on training under the guidance of experienced staff. What's your dog's New Year's resolution? Is it better behavior and a stronger bond with you? Maybe that's your resolution for your dog. Either way, check out Canine Companions' training videos on YouTube and learn from our professional instructors. From basic obedience to socialization, our assistance dog trainers want to help you and your pet dog succeed. 2017 graduation ceremony dates announced. Attend for free in-person or online. Free long sleeve tee with $40 or more gift shop purchase by Jan. 31. Use code 7789 for white or 7790 for gray at check out.